Freemius, Inc. is an authorized reseller of “LeadGenerator WordPress Plugin” and is the 'merchant of record' for your purchase. 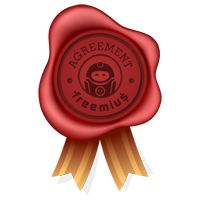 The agreement is between you and Freemius, Inc. on behalf of the Vendor behind “LeadGenerator WordPress Plugin” (the “Vendor”). You may not assign or transfer it without Freemius’ express prior written consent. Freemius, Inc. resells and distributes “LeadGenerator WordPress Plugin” and other plugins and themes "as is" and with no implied or statutory warranties, or guarantees that they will function exactly as you would like, or that they will be compatible with all third-party components and plugins. Product security and feature updates are included for free as long as your license is active. Updates will be delivered automatically from the WordPress admin dashboard or you can manually download the latest version of the product from your dashboard: https://users.freemius.com/store/1261/login/. Prices of “LeadGenerator WordPress Plugin” are subject to change without prior notice or consent. If You change your mind about your Purchase and have not yet downloaded the paid Product (we track that event), then, upon Your request within 14 days from the Purchase date, we will issue a full refund of the Purchase price. Refund requests made after downloading the Product (but before expiry of 14 days from the Purchase date) are handled on a case by case basis and are issued at our sole discretion. If You change Your mind about your Purchase and have not yet downloaded the paid Product, then, upon Your request within 14 days from the Purchase date, we will issue a full refund of the Purchase price.